It takes less than an hour to drive from Tel Aviv to Jerusalem, but this proximity is deeply misleading. 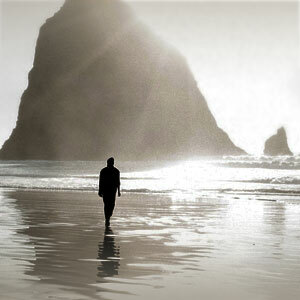 In the course of 42 miles, you change cultures and travel centuries. Tel Aviv was founded in 1909 and is a vibrant secular metropolis, one that is part of the modern European and Mediterranean world. Jerusalem is deeply religious, embedded in the Middle East and has been continuously occupied since 2,800 B.C. Tel Aviv was founded in 1909 and is a vibrant secular metropolis, one that is part of the modern European and Mediterranean world. The first part of the drive is across a hot flat plain, past Ben Gurion Airport and the nearby city of Lod. Then the highway starts to ascend into hills speckled with olive trees and scarred by ravines. Jerusalem lies at an elevation of 2,475 feet. On the western outskirts of the city are the offices, ministries and apartment buildings that have sprung up as the Israeli capital has expanded. But soon enough you come to the Old City, with its traditional low-rise buildings and walls of golden stone. For many years, the two primary places for affluent travelers to stay were the King David Hotel and The American Colony Hotel. The former is a large (233 rooms) resort-like property, constructed from pinkish stone and set amid extensive gardens overlooking the Old City. Its public areas are imposing, as befits an establishment that functions as a state guesthouse for visiting dignitaries. Delegations and motorcades come and go, and you feel yourself to have a temporary walk-on part in the political machinations of the Middle East. The American Colony is smaller (94 rooms) and offers individuality and charm. A mansion-style hotel set within a walled compound, it has long been a favorite with actors, writers and the world’s press corps. (The bar is favored by American military officers, and in the evening a good deal of gold braid is often on display.) The Old Wing was a former pasha’s residence, and his four wives’ rooms are now available as guest accommodations. In contrast to my other recommendations in the city, the hotel is located in east Jerusalem, which has a predominantly Arab population. 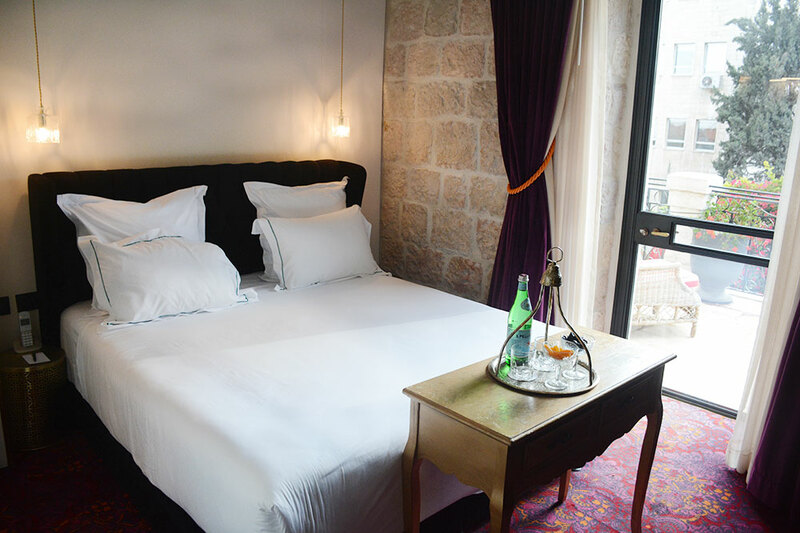 Located a seven-minute walk from the King David in West Jerusalem, the Mamilla Hotel (194 rooms) will appeal to those who prefer contemporary design; the property is also notable for the stunning view of the Old City from its rooftop bar and restaurant. And virtually next door, the Waldorf Astoria Jerusalem (226 rooms and suites), which opened in 2014, is a grand hotel with lavish public areas and a wide range of restaurants and facilities. I’ve always been surprised that Jerusalem, with its wealth of historic buildings, should lack a pedigreed boutique hotel. On this occasion, therefore, I decided to try the 24-room Villa Brown Jerusalem, which opened in 2017. Housed within a restored Ottoman mansion, it is situated an easy walk from both the Jaffa and Damascus gates, two of the principal entrances to the Old City. 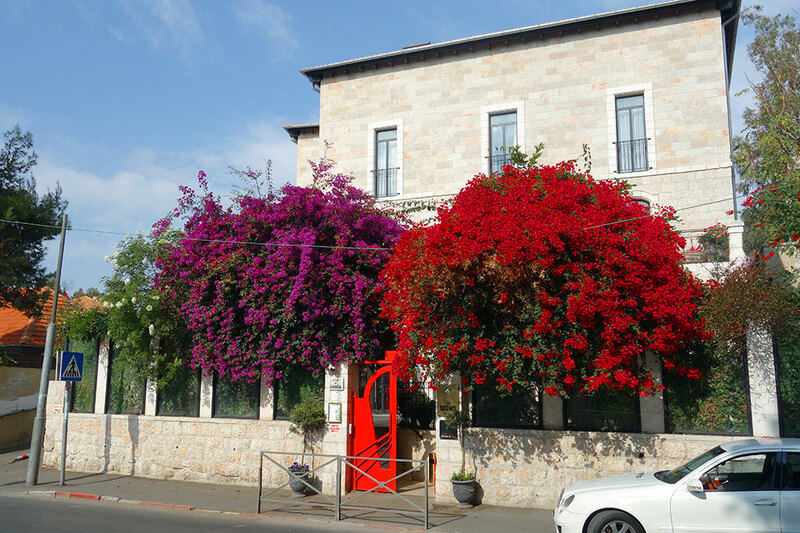 Although its location is ideal in some respects, the villa is set on busy Ha’Neviim Street, and although its garden and entrance are shielded by a plate-glass screen and swaths of bougainvillea, the traffic and the bustle of the sidewalk are still an intrusion. 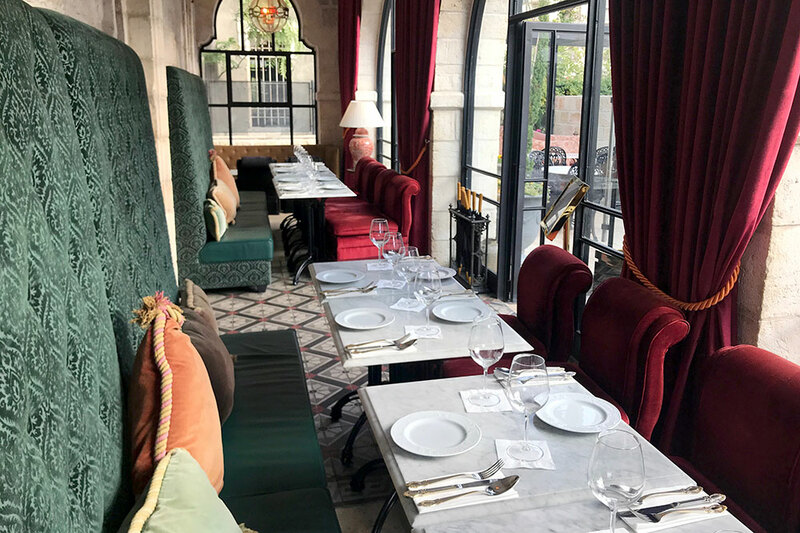 The property’s public areas have austere exposed stone walls but are decorated in a style that might be described as exotic, flamboyant or louche, depending on your taste in such things. A combination of crimson armchairs and drapes, potted palms, faux-zebra-skin rugs, gold latticework, marble tabletops and brass lighting fixtures struck me personally as being more appropriate to a nightclub. The receptionist, who spoke poor English, seemed rather flustered by my arrival, and her agitation only increased when I inquired about lunch. It wasn’t being served that day, she said, without explanation. Eventually I was shown to my Deluxe Terrace room, which turned out to be a mere 215 square feet. The terrace was larger than the room itself and came with a pair of loungers, but a view of the street, and the pedestrians’ view of me, didn’t encourage me to linger outside. (Signature and Grand Attic rooms are 280 to 344 square feet.) The bath was functional but correspondingly tiny. The room lacked a work desk, and the Wi-Fi connection was poor. The Villa Brown’s chief amenity is a rooftop spa with a Jacuzzi and a sun terrace. This is comparatively tranquil, being at the rear of the property with a view over rooftops to the dome of the nearby Ethiopian Orthodox Church. Unquestionably, the highlight of my stay was a superlative breakfast, which I enjoyed outside in the garden on a mild morning in late fall. Mezze dishes such as fried halloumi, feta salad, and stuffed peppers in tahini were followed by shakshuka (eggs poached in a sauce of tomatoes, chile peppers and onions), and Turkish bourekas (stuffed pastries). The coffee was strong, and the orange juice was incomparably delicious. Overall, however, the Villa Brown was a disappointment. Jerusalem, it seems, still lacks a recommendable boutique hotel. The wonderful Middle Eastern breakfast. My tiny Deluxe Terrace room; the poor Wi-Fi; the proximity to a busy road. The hotel is a 10- to 15-minute walk from both the Jaffa Gate and the Damascus Gate, two of the principal entrances to the Old City.